As one of the loveably creepy residents at 0001 Cemetery Lane, Uncle Fester comes straight from the cartoon imagination of Charles Addams. Originally running in The New Yorker, the popular Addams family was expanded to entertain fans on the big and small screens. Uncle Fester has been referred to both as the uncle of Morticia and the brother of Gomez. Despite the confusion, there is no denying the electrically charged Fester has a shocking style! An Uncle Festercostume is a great addition to an Addams Family party or Halloween haunted house. Dress up in an Uncle Fester costume and try to illuminate a light bulb just by sticking it in your mouth. 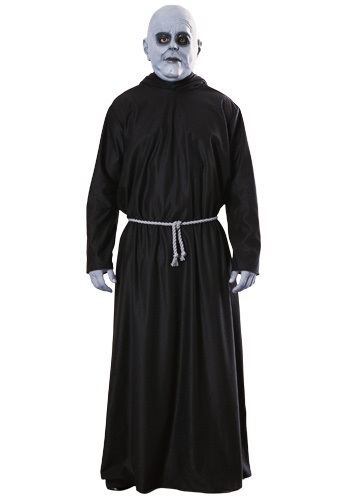 Play up a bald head and stocky shape with an Uncle Fester costume that features a simple black robe tied around the middle with a rope. If you are not challenged in the hair follicle department, just slap a bald wig on your head. Use face paint to create his pallid skin and dark, sunken eyes.